While Maxis is having its BlackBerry Z10 launch as we speak in which the telco is going to command one-month exclusivity over the new device starting from tomorrow onwards, guess who decided to come and troll the party? Yup, it’s DiGi. By trolling, we didn’t mean that the Yellow Man made a sudden appearance at the launch venue. Instead, DiGi has posted a rather cheeky posted on its Facebook page and boldly claimed that the telco will be offering a better deal than its rival. No actual pricing was mentioned but it is stated in the poster that DiGi might be offering the device from RM 8XX onwards. 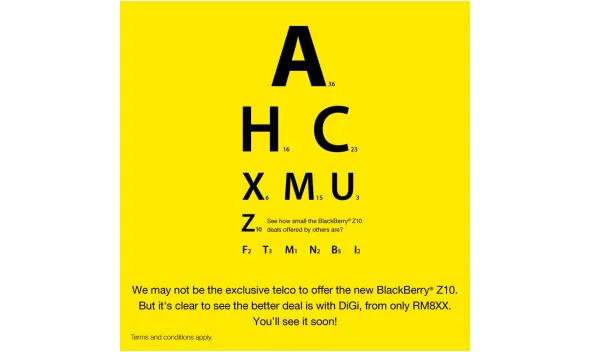 Well, let’s see how true that claim will be once the telco unveiled its BlackBerry Z10 plan on 8 April. Meanwhile, do check out our hands-on with the new BlackBerry Z10 right over here.